One of these vessels in the photo is up the creek without a paddle. But my day is starting off swimmingly. Some exercise to start the day and about to whip up a great breakfast. Another sunny day with beautiful temps. What is not to like. Oh yeah, some of you might be working? Sorry about that. I forgot I had some time off and didn’t mean to gloat. Well, maybe I did. 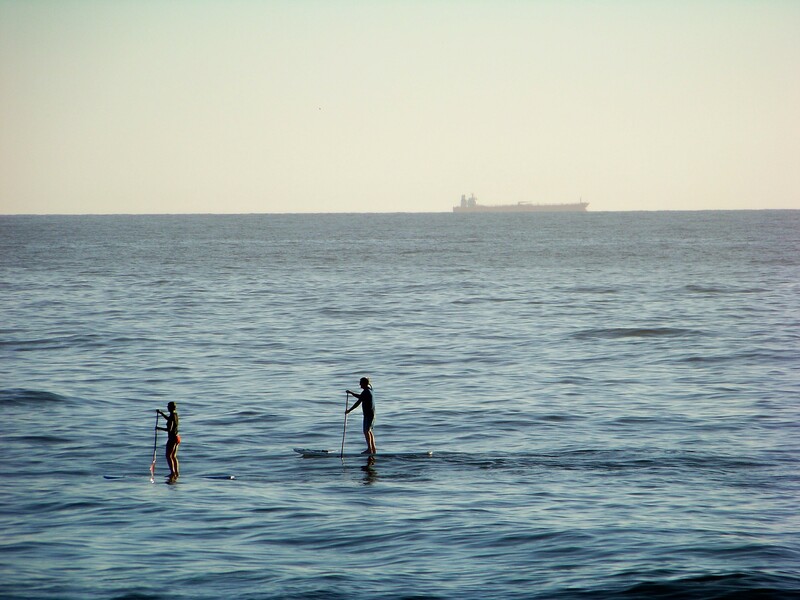 paddle boarding on the Atlantic ocean. sharing the high seas with a freighter. I have come upon a question of life that is perplexing me. Why would retired men who live at the beach be grumpy? Perhaps because “retirement” makes you feel as if you are not needed any more? Depends on the reason for retirement, way it was executed. You lose your routine, your purpose. Good point. I’ll have to remember not to let that happen. I’m sure you will have a good attitude about it. You are certainly vocal about looking forward to retirement.